If the guttering system in the property you live, work in or have rented is leaking or gets clogged very often, we can offer you our effective cleaning services. The technicians in our company are supplied with the latest tools and equipment for reaching, unclogging and cleaning downpipes, fascias and soffits. 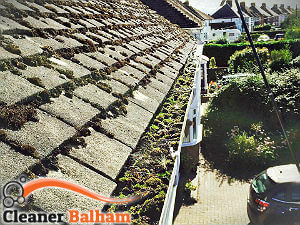 Our staff’s work is professional and ensures excellent gutter cleaning which can be used by in Balham by homeowners, renters and holders of business estates. Gutters need cleaning at least once per year which ensures their functionality and removal of the debris, wastes, moss, leaves and wastes that get clogged in them. Our staff’s work is provided with the help of tried-and-tested tools and equipment which are the latest available on the markets. We carry out vacuum cleaning inside downpipes and fascias to gather all wastes that have been collected and block the draining of rainwater. Our gutter cleaning services can be used by homeowners, holders of commercial estates and tenants in SW12 during weekdays and weekends. We carry our effective removal of mud, grime and leaves from fascias, downpipes and soffits. In case the customer needs before and after the cleaning pictures, our technicians can provide such. They use tiny CCTV camera which ensure supervising of the cleaning process so that it is implemented effectively. Call us to schedule the cleaning for a convenient date and time and get your no-obligation free quotation. Being exposed to the elements soffits, fascias and downpipes get clogged with all kinds of wastes which obstruct the flow of rainwater and can lead to leaks and moisture. 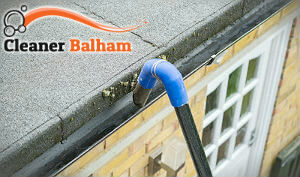 To protect your property form damages and use the drainage system long time book gutter cleaning which we provide in Balham, SW12 at least once per year. The work of our staff is professional and guarantees removal of blockages and wastes from downpipes and fascias.